This will be third appearance for Fidelis Morgan & the second appearance for Celia Imrie at Centuries & Sleuths Booktore. They are both British actresses the double as authors. Fidelis has been in many London stage production, but you may have seen her on the "telly" on Masterpiece Theatre and Masterpiece Mystery. Celia has been on both tto, but most recently you've seen her in the movie The Best Exotic Marigold Hotel. Fidelis has written Unntaural Fire and The Rival Queens, 17th Century Mysteries with the Countess Asby de la Zouche. Celia has written The Happy Hoofer an authobiogarhical work. If you have been at the last appearance of this "dynamic duo" you know they also perform ane encourage audience participation. William Feaver ; Deborah Moggach, The Best Exotic Marigold Hotel. Deborah Moggach discusses The Diary of Anne Frank. Deborah Moggach is currently considered a "single author." If one or more works are by a distinct, homonymous authors, go ahead and split the author. 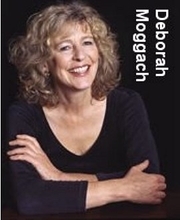 Deborah Moggach is composed of 3 names. You can examine and separate out names.